UMP | University of Minnesota Press Blog: Lefse advice + Finnish Blueberry Bars recipe from Beatrice Ojakangas. 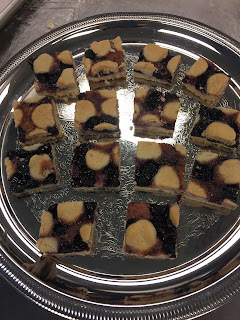 Lefse advice + Finnish Blueberry Bars recipe from Beatrice Ojakangas. 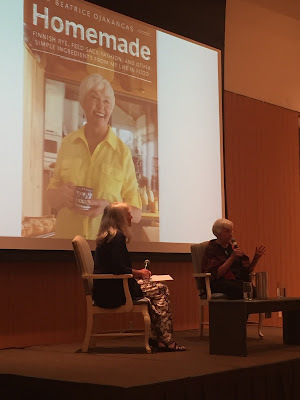 Last night, the Press celebrated the launch of Homemade: Finnish Rye, Feed Sack Fashion, and Other Simple Ingredients from My Life in Food, a memoir-cookbook by James Beard Cookbook Hall of Famer, author of 30 cookbooks, and self-described home economist Beatrice Ojakangas. This sold-out event at the American Swedish Institute in Minneapolis included a conversation with Star Tribune reporter Kim Ode, who writes "Baking Central." One of the evening's finest takeaways? A question about lefse prompted Ojakangas to divulge her potato of choice, the only potato that makes a good lefse: Russet. She does a combination of both ricing and mashing. at the Pillsbury Bake-Off in 1957, was later changed to "Chunk o' Cheese Bread"
The evening included a sampling of classic Ojakangas recipes: Almond Cardamom Scones, her Pillsbury Bake-Off award-winning Chunk o' Cheese Bread, and Finnish Blueberry Bars. The first two recipes can be found in Homemade; the third is published below. Bon appétit! We had a corner of a slightly swampy forty acres that had been burned over—probably in the 1918 forest fire. Many parts of northern Minnesota suffered the same fate, but the prize was that this is where wild blueberries abounded. We had blueberry bushes with so much fruit that we could actually “milk” the berries into a pail. These tiny, juicy, flavorful berries found their way into many treats at our house when in season. We made pancakes and muffins heavy with this juicy fruit of the bush. My aunt Ida was one who had her “secret” patches, too. Here is my favorite recipe for these bars, which could be cut into 1- x 2-inch bars to go with coffee, or into larger 3- or 4-inch squares for dessert. Preheat the oven to 375°F. Lightly grease and flour a 12- by 16-inch jelly roll pan. In a large bowl, mix the flour, sugar, and baking powder. Using a fork, blend in the butter until the mixture resembles moist crumbs. With your hands, press the crumbs together to make a dough. Reserve about 1 cup of the dough and roll the rest out on a lightly floured board to fit the jelly roll pan. (This crumbly dough may tear when it is being lifted into the pan, but it can be easily patched by pressing the torn pieces together.) With your fingers, form a ridge around the edge of the dough so that the filling will not run over during baking. For the filling, pour the blueberries into a small mixing bowl. Mash lightly to produce enough juice to moisten the berry mixture. Stir in the sugar, lemon juice, lemon zest, cornstarch, and salt. Spread the filling over the dough in the pan. 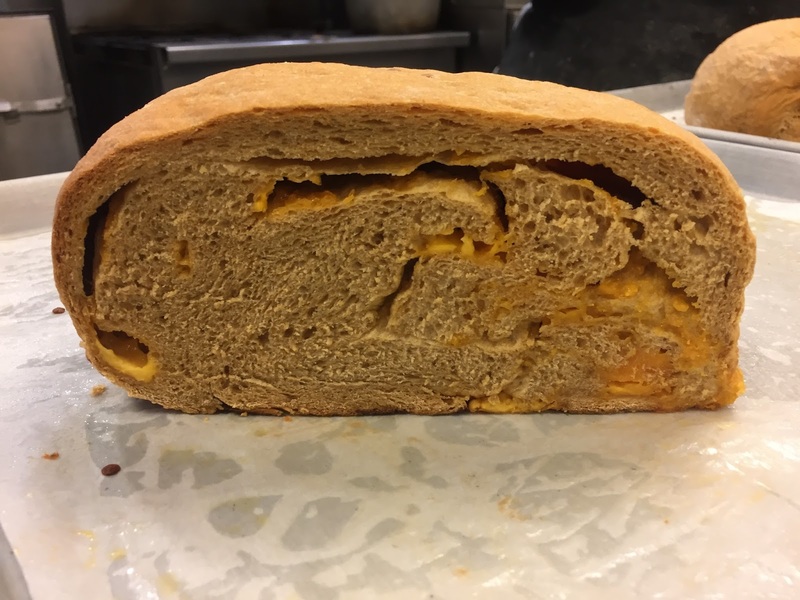 Roll out the reserved portion of dough on a floured board to about ¼-inch thickness. Cut in strips about an inch wide and place in a loose lattice pattern on the filling. Sprinkle the top with additional sugar. Bake for 25 to 30 minutes or until the crust is a light golden-brown. Cool and cut into squares for dessert or into bars for the coffee table. Makes about 12 desserts or 48 bars. Beatrice Ojakangas grew up on a small farm in Minnesota and graduated from the University of Minnesota–Duluth. 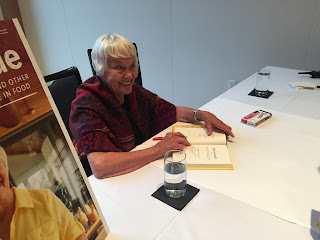 Childhood 4-H, college Home Ec, and work as a hospital dietary assistant, food editor, teacher, homemaker, and mother influenced her cooking career and her food writing for such publications as Gourmet, Bon Appétit, Woman's Day, Family Circle, Better Homes and Gardens, Midwest Living, Cooking Light, and numerous newspapers. 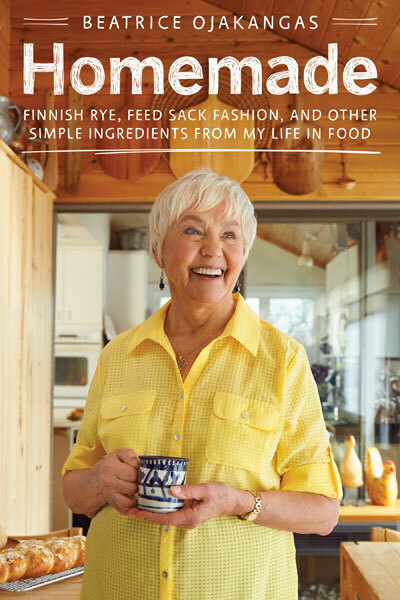 Ojakangas is the author of twenty-nine cookbooks and was inducted in 2005 to the James Beard Cookbook Hall of Fame. She received an honorary Doctor of Humane Letters from the University of Minnesota in 2007.